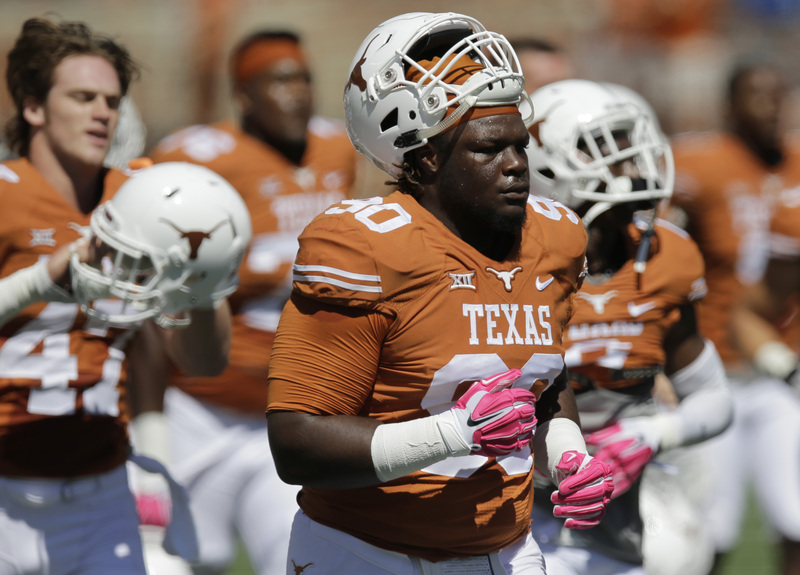 Texas defensive tackle Malcom Brown, a finalist for two national college football awards, was voted to The Associated Press All-America Team on Tuesday. Brown, who was named to the Walter Camp All-America Second Team last week, has been a key cog in the Texas defense which ended the regular season ranked No. 26 in the FBS in total yards allowed (348.3 per game), No. 12 in passing defense (186.3 ypg), No. 8 in yards allowed per play (4.67), 16th in passing efficiency defense (108.34 rating) and tied for seventh in sacks (3.25 pg). A finalist for both the Bronko Nagurski Trophy (nation’s best defensive player) and Outland Trophy (top interior lineman in the country), Brown leads the team in tackles for loss (14) and sacks (6.5). The junior has 64 stops and ranks tied for fifth in the nation in sacks by defensive tackles (0.53 pg). Brown, a junior, has been placed on three other All-America teams this month. He was named a first-team choice by CBS Sports, USA Today and ESPN.com. He is the first Longhorn defensive tackle to earn All-America honors from AP since Rodrique Wright in 2005. Brown can become a consensus All-American by earning a nod from one of the three other nationally-recognized organizations - The Sporting News, Football Writers Association of America (FWAA) or American Football Coaches Association (AFCA). He would secure consensus first team All-America honors by being placed on two of those three. PK Anthony Fera and DL Jackson Jeffcoat were consensus first team All-Americans last year.